The Skoda Superb is a car that literally lives up to its name. Despite being pitched against everything from a Ford Mondeo up to a BMW 3 Series, the plucky Superb makes an excellent case for itself – especially if space is at the top of your agenda. No matter where you sit inside the Superb, you’ll have room to stretch out. Its boot is larger than those in most rvials, too, meaning that even with a couple of tall adults sitting in the back, you’ll still have room on board for their holiday luggage. Skoda adds some neat touches to make your life easier, including carrying hooks to hang your shopping on, a rechargable torch and umbrellas hidden inside each front door – a feature that you might expect to find on a Rolls-Royce, but not usually on a mid-range family car. Our full 16-point review can take you through the Superb’s other virtues, but this guide is dedicated to the plethora of options you can add. Assuming you’ve gone for our recommended 2.0-litre diesel engine and SE specification, you’ll already have most of the kit you’re going to want, including dual-zone climate control, rear parking sensors and an 8.0in touchscreen infotainment system. Here’s what we’d add, though, to bring even more luxury without upping the cost too much. You’ll appreciate this one on cold mornings – rather than using a ventilation system to de-fog your car’s windscreen, you can press a button and watch as the ice and frost disappear far more quickly. This system uses a small metal-coated layer within the windscreen to clear your view. It’s only available in conjunction with heated seats, though. Our favourite SE models come with rear parking sensors as standard, but this reversing camera can really help to take the stress out of parking by showing an image of the area around your car on the infotainment screen. It’s only available in combination with rear LED lights, though. If you struggle with parking, then Skoda’s own self-parking system could also be worth looking at, although it will cost you £600. If you’re doing a lot of motorway miles, this system will help to make those long journeys far more relaxing. Lane-keeping assistance keeps the vehicle within its lane and warns you if you start to stray out of it. Small radars keep an eye on your blindspot, too, giving you a visual warning if you indicate to pull out when it’s not clear to do so. So you’re struggling across the car park laden with shopping. Your keys are in your pocket, so surely you’re going to have to stop to fish them out before loading up? Wrong. With Skoda’s keyless entry system, as long as the key is on you, you can gain access to the vehicle. You needn’t worry about using the key to get going, either, because this upgrade also brings a starter button on the dashboard. The Superb’s boot space is fairly cavernous, but on those rare occasions when you need to drop the rear seats, these small levers in the boot will make the process far easier. And with the rear seats folded away, you might as well be driving a van with space enough for just about anything. Ikea, anyone? Is that grandfather clock or those skis really going to fit inside the Superb? You bet, thanks to a folding front passenger seat that extends the load bay for very long items. 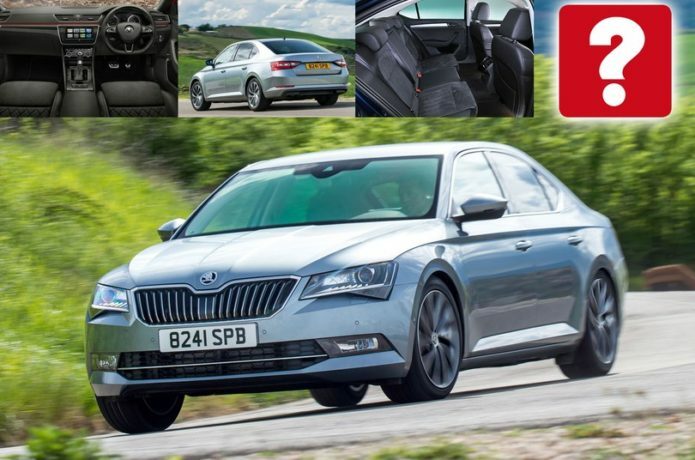 At first glance, the larger 9.2in Columbus infotainment system with sat-nav, a DVD drive and integrated wi-fi hotspot looks very tempting indeed. But given that it will cost you more than £1600, we’d steer well clear – especially since you can control your phone via Apple CarPlay and Android Auto as standard on SE models and use that for navigation instead.